The Commission for Race Equality standards were launched in the South West at a conference in Exeter. The event was attended by a Devon County Council Co-ordinator in Social Work Education who selected service user standards to evaluate work submitted by students studying for their social work degree on a local programme. This local review raised concerns that social work students were not addressing anti-racist practice sufficiently in their practice assignments. From this review draft anti-racist standards were compiled as guidance for students and programme placements locally. A process of consultation followed to establish clear methods for teaching and assessing anti-racist practice and to gather feedback on the usefulness of standards in setting a baseline for practice. The Anti-Racist Practice Development Forum (ARPDF) was established to develop these local standards from the initial pilot, with the overall aim of maintaining “an active focus on the impact of racism in society, its implications for social work practice, and the development of anti-racist strategies.” (Butler, Elliott, and Stopard, 2003). The Anti-Racist and Anti-Discriminatory (ARAD) Standards for practice were disseminated to other programmes in the area, with different levels described for Stage 2 (interim) and Stage 3 (final degree level). Active participation in the development process was emphasised and the ARPDF evolved as an open network across the South West. The ARPDF organised an “Innovations in Anti-Racist Practice Teaching” conference which was attended by 60 practice teachers and practitioners in the South West region with the emphasis on sharing knowledge and resources to promote anti-racist practice. From this and other networking events the ARPDF developed teaching and learning resources to ensure anti-racism did not get side-lined within the wider anti-oppressive practice framework. The specific challenges of promoting anti-racism in predominantly white, rural regions of the UK (Jay, 1992; Baldwin, 1996; Dhalech, 1999) were the focus of much of our work. ARPDF resources focussed on the importance of understanding whiteness and white privilege in challenging racism and promoting the rights of Black or Minority Ethnic (BME) individuals and communities. Stage 1 (Foundation level) Anti-Racist and Anti-Discriminatory (ARAD) Standards were added which encouraged students to “consider how we are all products of our own history and to reflect our own cultural heritage, personal experiences and immediate cultural context.” (Jelley, Horton and Soper, 2004). “Racism is being left unchallenged across many agencies and services in Cornwall. It is often ignored or covered up, leaving those who have been racially attacked more isolated and vulnerable.” (Anti-Racism Project, 2004:49). Read the report. The ARPDF began a review of the ARAD Standards prompted by feedback from students about potentially oppressive methods in ‘enforcing’ the standards which left learners afraid to share ideas and opinions for fear of ‘getting it wrong’. Discussions also focussed on the desire to become less ‘anti’ and more ‘pro’-active in promoting good practice in race relations and developing global perspectives in social work. The Anti-Racist Practice Development Forum (ARPDF) was consequently renamed the Forum for Race Equality and Diversity Awareness (FREDA). A subgroup of FREDA was formed to review the ARAD standards. In line with the research findings the ARAD standards were replaced by FREDA Standards for the Promotion of Race Equality, Human Rights and Social Justice. The new standards emphasised how understanding ourselves is not static, and that continual questioning of who we are and the language we use is essential for ongoing professional development. Students, service users and carers, practitioners and academics are encouraged to ‘learn together’ and to ‘engage in the debate’, creating a safe environment to do so. View the FREDA Standards documents. The FREDA standards were adopted in the academic year 2008- 2009 and subsequently incorporated into all the social work programmes locally. FREDA activity was revived when concerns arose that integration into the programme meant some of the specificity of developing anti-racist practice was becoming lost. There was a lack of visibility again in student accounts. Network members were re-contacted and regular meetings re-established. Ensuing discussions focussed on revisiting the standards, as recommended by the original Boyce et al (2008) research. The aim was to evaluate whether the principles were visible in social work teaching and learning, and applied in practice. FREDA reviewed and mapped the Standards to the Professional Capabilities Framework, identifying the specific areas of congruence and the standards which are unique to FREDA principles. FREDA also undertook a Pilot study into the application of the FREDA Standards in Stage 2 student final assignments which provides some useful examples of the critical application of learning to practice in line with the standards. FREDA organised the first “Learning Together” Event which focused on Female Genital Mutilation (FGM) as an abuse issue. Alexis Wright from Njenni Enterprise: Ending Violence against Women and Girls spoke at the event and supported our learning in meeting the FREDA standards. Resources from the day are available. FREDA organised the second “Learning Together” Event which focused on Modern Slavery and Human Trafficking. Speakers included Devon and Cornwall Police, the Salvation Army, the Gangmasters Licensing Authority and Local Authority Modern Slavery Leads as first responders. 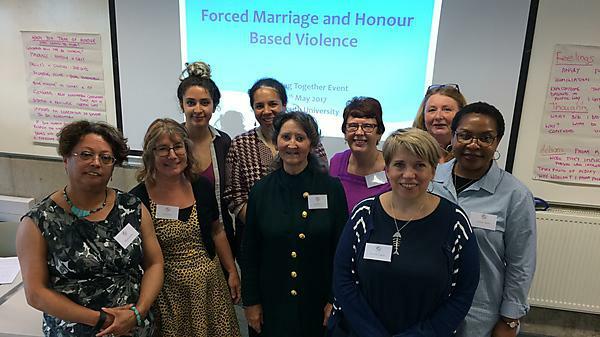 FREDA organised the third “Learning Together” Event focused on Forced Marriage and Honour-Based Violence. Alexis Wright from Njenni Enterprise returned to speak about working with perpetrators of forced marriage and so-called honour-based abuse, Neil Day spoke about the work of the Forced Marriage Unit and Julie Paget from Plymouth and Devon Race Equality Council talked about survivor perspectives. The FREDA website was launched.